The People of Itanagar have been facing the menace of cash scarcity for last one month either in bank or in ATM. Many ATM are out of cash on daily basis as the cash replenish is less in compare to normal day as the SBI authority went on saying we received in sufficient cash from RBI as per our demand. They also said that we do not received cash in time and due to which the customer have to suffer. One of the senior SBI Officer of Itanagar Regional Office said that due to march ending there have been rush of customers. Many time the customers have their urgency of school admission, medical urgency and other important requirement and we do not return them empty hand in normal case. But we did some restriction as due to insufficient cash in the Bank due to non receipt of the sufficient cash in time as per requirement. Another officer of the SBI said that there are more than 70 ATM of SBI in capital complex area and we have been replenishing on daily basis and mostly are functioning however the cash scarcity may be due to frequency of customers increasing in those area where the SBI ATM exist. But the local have been showing their serious concern about the cash scarcity and insufficient cash in ATM and cash shortage in different ATM in state capital in social media and even in nearby banks premise and demand action to the bank officers and also appealing the state and district administration to make a formula so that the local people including the youths and students do not suffer on the whim and fancy of the banks. 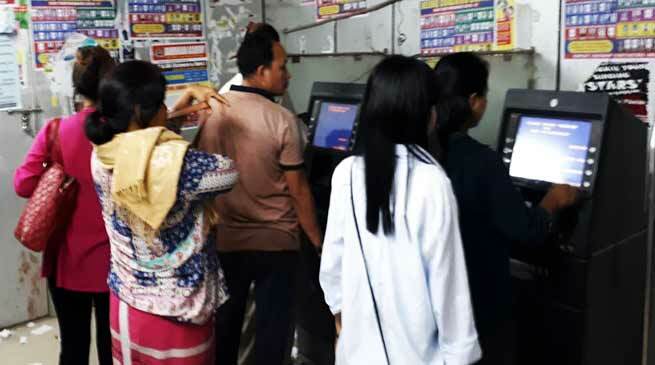 The All Arunachal Contractors Welfare Association (AACWA) General Secretary Nabam Akin Hina urges All Banks in twin capital to make available in all their ATMs machines and make available cash in their branches. Since all bankers issue ATM cards to all customers and charges were deducted automatically from account but they didn’t make available cash at their ATMS machines. AACWA urge to state government to give necessary direction to All Banks authorities to immediate supply of cash to respective banks and ATMS.